Spicy bolognese sauce gets kicked up a notch with garlic, spicy sausage and red pepper. A hearty meal made even better with a glass of good Italian wine. Coat a large pan with oil spray, and heat on medium high. Add the sausage to brown, turning occasionally. Cook for about 5 minutes until browned. Remove the sausage from the pan, and set aside to cool. Add the olive oil to the same pan you cooked the sausage in, and heat on medium. Add the onions and cook until softened, about 5 minutes. Add the garlic and cook 1 more minute. Add the ground beef to the pan, and cook until it begins to brown, stirring occasionally. After about 5 minutes, stir in the red wine and cook until the wine has been mostly absorbed. Stir in the tomatoes and beef broth. Add the red pepper flakes, basil, marjoram. Bring to a simmer. Slice the sausage into small bite sized pieced, and stir the sausage into the sauce. Simmer the spicy Bolognese sauce for about an hour, uncovered, stirring occasionally. After the sauce has been simmering for about 30 minutes, begin cooking the pasta according to package directions. When the pasta is done, drain, and toss immediately with the spicy Bolognese sauce. Plate and serve topped with a generous amount of Parmesan cheese. Enjoy with a good glass of Italian red wine! 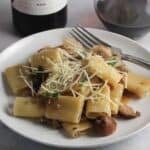 If making this recipe for just a few people, you can start by cooking just 1 pound of pasta, and adding the desired amount of sauce. Cook some fresh pasta another night to enjoy with the leftover sauce. I try to use grass fed ground beef when possible, as it is higher in omega 3 fatty acids and other health benefits. I often use chicken or turkey sausage for a healthier sauce, but you can certainly go with a traditional pork sausage if you prefer. I like the Andouille for its garlicky flavor, but a spicy Italian sausage would certainly work well here too. You can adjust the amount of red pepper flakes based on the level of spiciness you like.